The hustle and bustle is slowly easing, the streets are aglow with winterly light, the air is filled with the scents of wood fires, cinnamon and fresh cookies – and Christmas is just around the corner! It’s been an exciting year which brought many new experiences and some great new products like the Nuki Keypad and the Nuki Smart Lock 2.0. With the above in mind, we would like to offer you a pre-Christmas present and inform you about our final update for 2018, which includes a few new features and improvements to close the year. You will now see suggested lock actions when you tap your Nuki Smart Lock. Further lock actions can be displayed by swiping upwards. Swiping downwards makes them disappear. This new feature is especially helpful for those who are not yet familiar with the Nuki app. It allows them to find and execute the correct lock action even faster, without first having to deal with additional features. Our valued Airbnb users will particularly appreciate this new feature. In line with the simplified display of the lock actions in the Nuki smartphone app, we have also updated the Nuki app for the Apple Watch. Now you will immediately have all the most important lock actions at your disposal and will be able to quickly lock your door from your wrist. You will also see the door sensor status of the new Nuki Smart Lock 2.0 in the redesigned Apple Watch interface. A visual impairment is often an enormous daily challenge. 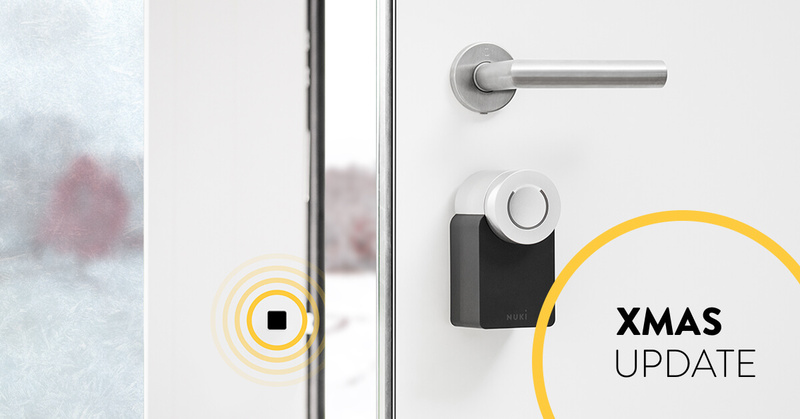 All the more reason for us to be pleased that so many people have told us that the Nuki Smart Lock makes everyday life easier for those with impaired vision, since they no longer need to find the door key. In order to make it even easier for those with disabilities to use Nuki products, we have optimised the main screen and the most important controls of the Nuki app so they can be used with the voice over feature. Christmas is a time for giving. It is also the time with the most new smartphones. We’ve made it very simple to transfer your Nuki access authorisations to your new smartphone, so you won’t have to spoil your holiday mood and dampen your Christmas cheer. When you restore a backup from your old device to your new smartphone, your authorisations will be transferred and deleted from your old smartphone for security reasons. This is an essential security measure to prevent the duplication of access authorisations and to ensure the security of your Smart Lock at all times. Last but not least, we have a very special Christmas present for all users of first-generation Smart Locks with no HomeKit connectivity. Now you can control your Smart Lock through Siri without using HomeKit! In order to use the new Siri shortcuts, you must first activate them in the Nuki app. The corresponding setting can be found under “Siri Shortcuts” in the Nuki app menu (top left). You can choose “Manage Shortcuts” there, or go to “Nuki” > “Siri and Search” at the bottom of the iPhone Settings menu. Then you can record a short voice command for each desired lock command and you will immediately be able to use them with Siri. Please note: For security reasons, Siri shortcuts can only be used within the Bluetooth range of the Smart Lock. We hope that our little surprise gift will make you happy before Christmas. We wish you a Merry Christmas and a smart start to the new year, in which the new Nuki Opener will be revealed! N.B. : To use the new features you need the app version 2.1.0 (or higher)..